On female lectors specifically, I think a lot of traditional Catholics will say simply that we should not have lay lectors at all. The order of Lector, after all, is (historically) a clerical role. Here's a little trap: Pope Paul VI changed 'minor orders' (porter, lector, exorcist, acolyte) so the seminarians who receive them are no longer regarded as clerics, and they can also be given to ordinary lay men - but not women. Lay readers are almost never 'instituted Lectors', they are substituting for 'real' lectors, just as in principle Altar servers are substituting for 'real' acolytes. The argument has been made that because women substituting for non-clerical minor orders (which can only be held by men) is less obviously wrong than women substituting for clerical minor oders (which can only be held by men), then we should conclude that it is ok for women to be readers and servers alike. This argument comes down to hair-splitting legalism, something surprising common with liberals when it suits them. Anyway, (male) lay servers are clearly practically necessary, but lay lectors are not, never have been, and never will be. The endless practical, pastoral, and theological problems lay readers raise are for nothing. Just stop it. Let the priest read the Epistle: isn't that a simple solution? 'Benedict Constable' (BC) seems too caught up in the Novus Ordo way of doing things to consider this response, but the real objection I have to his treatment is something else. His argument is that the role of proclaiming the Scripture is a masculine role; the receptivity of the congregation to the Word is a feminine role. Ergo, it is symbolically appropriate that readers be exclusively male. as many saints and theologians have maintained, all Christians are, before God, symbolically in the role of bride and mother. Creatures are fundamentally receptive; and the Church is a bride, of which all of us are members (cf. Ephesians 5). Now, naturally, this symbolism is not going to be pressed into the faces of men in such a way that they are made to feel uncomfortable. For men, we need the language of fighting like soldiers, being carpenters and guardians, etc. But still, our fundamental identity as a Christian is one who receives grace and is made fruitful by it. This is why the Blessed Virgin Mary is not just a model for women but for all Christians as such. It appears that BC's feet are getting a bit cold even as he types out this paragraph. We don't want to press this idea into men's faces, eh? I should think not. Something is going awry here. 1. Bridal mysticism. In the Song of Songs and in St Paul (and elsewhere in both Testaments), we hear of Israel/ the Church being described as the Bride, and God or Christ as the Bridegroom. St Bernard of Clairvaux (d. 1153) applied the idea differently: that one could think of the soul as the beloved/ bride and Christ the lover/ bridegroom; the feminine Church community, represented by Our Lady, became a model for the individual Christian. The immense influence of this idea meant that popular devotion began to suggest that a feminine role vis-a-vis God is appropriate to every Christian. This idea is a complete reversal of the attitude of Scripture, which describes the individual Christian as taking on the role of a son (and heir) of the heavenly Father, the Christian as a soldier, and as imitating Christ. The central metaphors of the spiritual life flipped, in this way, from male to female. 2. Aristotelianism. Aristotle's metaphysical system of form and matter identifies the female with the material, and the male with the formal. The feminine tends, then, to be associated with the passive and receptive; the male with active and the giving of form or structure. In the spiritual realm, it is easy to see how this combines with bridal mysticism to suggest that because Christians should be receptive to God's grace and to God's re-forming of them, that means they need to be passive and in that sense feminine. Podles points out that this causes problems for both sexes. Passivity, he points out, is not the central feminine trait: rather, that is connected with the bonds of community. Our Lady's response to the Annunciation was not to lapse into passivity, but to get onto a donkey and make a long and potentially dangerous journey to reinforce the bonds linking her and her unborn Child with St Elizabeth and the unborn St John the Baptist. I have a number of corrections and reservations to make about Podles' argument, which can be seen in the subsequent post in the series, but on these two points I think he is clearly onto something. BC's expression of his argument illustrates the problem. Notice, first, how he adopts the idea of female receptivity as if it is to be found in the scriptural passages he cites. But it isn't, for the simple reason that St Paul was writing 11 centuries before Aristotle's unfortunate analogy between sexual reproduction and hylomorphic metaphysics started to have an influence on Catholic theology. And notice, second, how he slides, apparently without even noticing, between talking about the community as female ('the Church is a bride, of which all of us are members'), to talking about the individual Christian as female ('all Christians are, before God, symbolically in the role of bride and mother'), as if the scriptural use of the first idea somehow gave support to the second. This is not to say that bridal mysticism, supercharged with Aristotelian metaphysics, is incompatible with the Faith. It is just to say, what should be obvious, that is not part of the Faith. It is not fundamental, and should not be used as an interpretive lens for understanding the theological sources of Scripture and the Liturgy. The fundamental metaphor between the sexes and the spiritual life, which is rooted in Scripture and reflected in the Liturgy, is of God as Father, Christ as Son, the Church as Bride and Mother, and Christians as Sons, Heirs, and Brothers of Christ. (The Old Testament writers are equally comfortable talking about Israel as a son, as a matter of fact.) Christ taught us to pray Our Father, not 'Our Husband'. If the latter idea, in fact, does not put your teeth on edge, you need a new set. "The [Eastern] iconostasis symbolically is Heaven, and its liturgy, which anticipates Heaven, is celebrated only by members of the clergy. The nave is symbolically the earth, the abode of men and women who are preparing themselves to enter into Glory. This is by analogy the same mystery as that of Christ-the-Bridegroom, renewing in the sanctuary His sacrifice, which is gratefully received by the Church-His-Bride who is still in pilgrimage here below." The importance of the Sanctuary as a space reserved for men is a theme developed by Fr Brian Harrison in his treatment of Altar Servers; he points out that even as late as the 1975 General Instruction women were forbidden from entering the sanctuary, and as a result it is envisaged that female readers would have to read from outside it. Interesting post and some good points contra Constable. On the other hand, are you taking seriously enough the Patristic witness that Fr. Saward cites, where the identity of the Christian and the Virgin Mary is very strongly accentuated? It's not clear to me why this needs to make people squeamish, any more than a woman should feel odd being called "a son of God." Supernatural mysteries are going to shake us up because they don't map neatly onto natural limitations. On the Patristic witness, I'd need to see more. The point is not about comparisons between us and Our Lady, as with the Augustine quote, but the attempt to flip the central metaphor of the spiritual life from sonship to bride-ship. St Bernard, no doubt uninentionally, may have opened the way to this among his over-enthusiastic followers. Did the Fathers? Convince me. Actually, supernatural mysteries do map onto natural limitations: as JPII reiterated, Grace builds on Nature. As for why it is such a problem to tell men they should be female, and not such a problem telling women they must be sons and soldiers of Christ, that is easy. Masculinity is achieved, and can be forfeited. Feminity is something women are born with; they don't worry about losing it because they can't. See the first of my Podles posts. I'm not quite sure how you can say that women are both with femininity but men are not born with masculinity, unless you are equivocating and in the former case talking about a natural endowment but in the latter about a social construct or set of habits. I've met far too many women who are not ladies and wouldn't recognize femininity if it hit them in the pants. And, although homosexuality is far more prominent among men, recent political events have certainly brought an unseemly number of female couples out of the woodwork. In them, femininity has gone awry. "In comparison with Christ, we are all brides; in comparison with the Father, we are all sons. Yes, the images clash and refuse to mesh—in the order of nature, one cannot be simultaneously a son and a bride—because we are dealing not with natural realities but with a supernatural mystery of divinization so profound that no single way of speaking can fully express it. And yet, the precise images we use do matter: they cannot be arbitrarily switched around, for we are dealing with definite truths, not with vague mythic metaphors." On being born with femininity, you'll have to read Podles' argument, at least as I summarise it. This about all being brides: no! In relation to Christ we are all brothers. That is what Scripture says. Don't privilege a metaphor popularised by spiritual writers over a metaphor embedded in both Testaments of Scripture. You must see the paradox of opposing the feminisation of the liturgy by demanding the feminisation of men. This is not the solution; it is part of the problem! I think you are simplifying your own interpretation of Podles here a little, but perhaps that is unfair. In order to achieve / attain womanhood, women don't have to do anything physically external to their own bodies, whereas men must perform external actions in order to emulate / equal the trials of childbearing and thus attain manhood in full. I think that argument follows the physical realities Mr Kwasniewski alludes to without going against the thrust of Podles argument (which I have only read in your summary). My tutor (who was a literature don and not a theologian but was a woman of prayer and deep learning) was interested in the idea that Adam was not fully man until Eve was created. Under this argument (which I seem to recall she said was echoed in the writings of JPII before his election but I couldn't give you a reference off hand) man is definable by reference to woman, and thus can only be properly understood when compared to woman. Her interest in this argument was in part driven by her fascination for a term coined by Puttenham, who "Englished" the Greek "Orismus" as the "definer by difference". 'In nonsolemn Masses celebrated with the faithful participating a qualified reader or the server reads the lessons and epistles with the intervening chants; the celebrant sits and listens' (art.50). The use of the present indicative (I can't find the Latin text, but assume it uses the same tense and mood) suggests that it was meant as a rubric to be followed. I remember as a teenager serving a weekday Mass circa 1965 being expected to read the epistle, gradual and alleluia from an English lectionary. On Sundays a lay reader was usually deputed from the congregation. I don't recall when women started doing it, but I suspect it was before 1970. 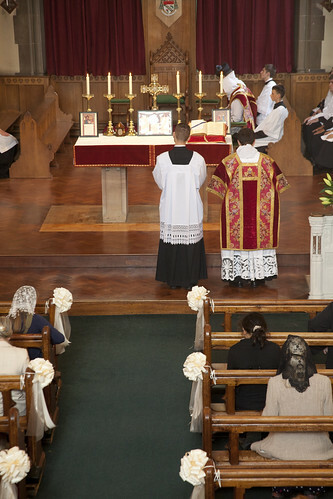 On the face of it this this is an extension of the 1960 rubrical change for solemn Mass, now extended to all Masses. Lay readers substitute for the subdeacon and the schola, while the celebrant 'sedit et auscultat'. In the case of the Missa Cantata where the celebrant sings the epistle and gospel Inter Oecumenici envisaged that these would henceforth not be sung but recited in the vernacular. The priest celebrant would neither sing nor say them, and so would have to delegate them to 'qualified readers', whatever that means. Whether intended or not, this quickly got caught up in the idea that lay ministry in reading the lessons was an example of 'active participation'. This is of course nonsense. If the congregation joins in the responses and sings the chant then this is a form of exterior participation. Listening while someone reads the epistle is not enhanced if the reader happens to be a layman/laywoman who comes up from the congregation. Even worse, such ministries were often described as 'special', thus elevating a small minority of the laity above the rest of the herd and creating a hierarchy of the laity. There is no real necessity for lay readers, male or female. It's hardly participation if one person is reading and everyone else is listening. There may be a necessity for competent laymen, ex temporanea deputatione, to sing those things that clerics are unable to - this would include the epistle or parts of the Passion narrative, or the Exsultet - but this is best confined to the Novus Ordo. From a practical non-theological point of view may I say that the issue here is what has been called the “Feminisation” of the New Mass. In my parish, reasonably typical for my area, door keepers, choir, servers, readers, bidders, lay distributors of Holy Communion, are predominantly female, elderly and getting more so. That is one reason why there are virtually no young males of say, 20+ and on their own, at the New Mass. 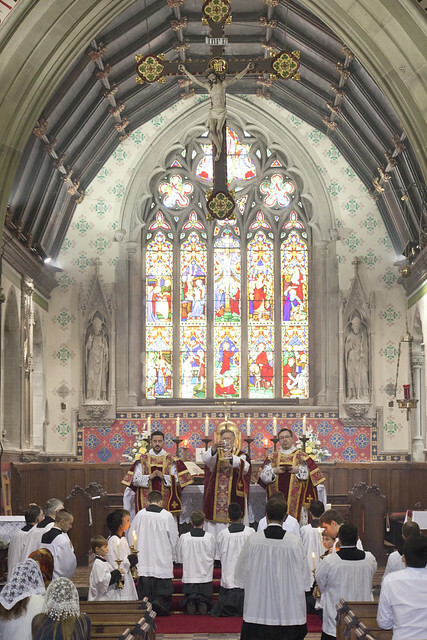 It is quite different at the, shall I say Latin Mass, I occasionally get to. As for the bidders, they simply reflect the TV news of the night before, which somewhat annoys me, as does the priest, sitting there looking spare while all this goes on. If I were a young now back in my twenties, I suspect I would find other things to do on Sunday morning! ps the article/comments good. Won't attempt to compete.